BAMAKO — The United Nations has dispatched human rights experts to central Mali to investigate a weekend massacre of at least 157 villagers seen as one of the worst acts of bloodshed in a country beset by ethnic violence. The attack, in which women and children were burned in their homes by gunmen, escalated a conflict between Dogon hunters and Fulani herders that killed hundreds of civilians in 2018 and is spreading across the Sahel, the arid region between the Sahara desert to the north and Africa's savannas to the south. "A team of 10 human rights specialists, a child protection agent and two MINUSMA investigators have been deployed to the Mopti region to conduct a special investigation into Saturday's terrible events," U.N. mission spokesman Olivier Salgado tweeted on Wednesday. MINUSMA refers to the U.N. mission in Mali. International Criminal Court chief prosecutor Fatou Bensouda said this week that the crimes could fall under ICC jurisdiction and that a delegation would be sent to Mali. A U.N. Security Council mission was already visiting the West African state to seek solutions to ethnic violence when the massacre occurred. An official from a nearby town said on Saturday that armed men dressed as Dogon hunters assaulted villages populated by Fulani herders. The Dogon suspect the Fulani of harboring Islamist militants, charges the Fulani deny. The attack came less than a week after an Islamist assault on an army post that killed at least 23 soldiers, also in Mali's central region. That attack was claimed by an al Qaeda affiliate. 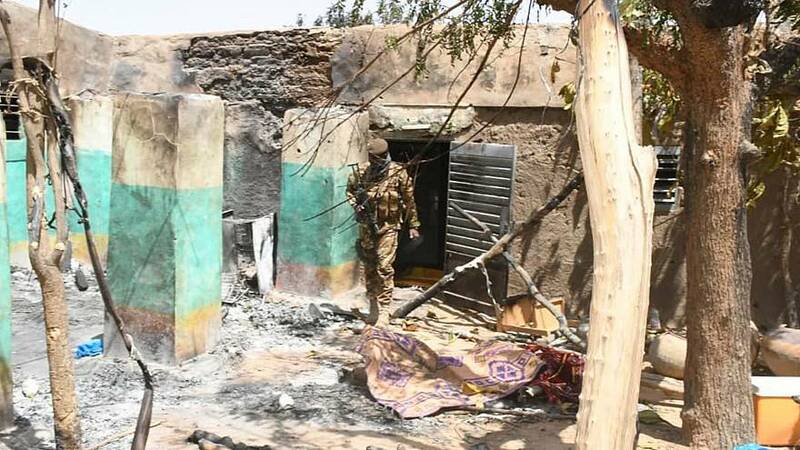 In a statement on Tuesday, MINUSMA said a Dogon village in the region was also attacked on the night of the Fulani massacre, leaving at least four people dead. Tacit outsourcing of the fight against jihadists to vigilante groups with scores to settle has unleashed ethnic strife across the Sahel. In neighboring Burkina Faso at the end of December, ethnic Mossi militia killed dozens of Fulani in revenge for the killing of a village chief by jihadists. U.N. human rights spokeswoman Ravina Shamdasani said on Tuesday that 219 people had been killed by anti-jihadist vigilante groups in Mali since the start of this year. Malian President Ibrahim Boubacar Keita responded to the attack on the Fulanis by disbanding an anti-jihadist vigilante group called Dan Na Amassagou, whose Dogon fighters are suspected of being behind the massacre. The group has denied its members were involved and rejected the government's dissolution.